$1,100.00 M 1936 General Staff Academy visor hat, 1936-40. In olive green napped wool, with crimson cloth band and white piping. Early style visor. Size 58. Outstanding specimen. $340.00 Army General's dress visor hat, circa late 1960s. Early example with teardrop sweat shield marked "TsEP". Small size, approx. US 7. In very good condition. $95.00 Soviet Army (Land Forces) General's field visor hat, dated 1980. Big size 59. 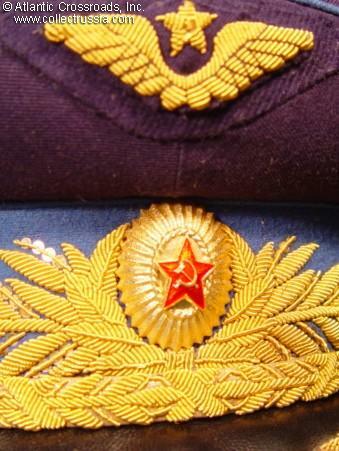 A classic Soviet hat of the Afghan War era, in near mint condition. $290.00 Service visor hat for an Army (Land Forces) General, dated 1974. Large size 60 (US size 7 ½). In outstanding condition. $475.00 Armored Corps General Full Dress Visor Hat, circa late 1950s - mid 1960s. Features early hat badge in gilded brass and enamel and an early TsEP factory marked sweat shield. Size 57 (about U.S. size 7 1/8). Beautiful early hat in superb condition. $240.00 Armored Corps general service visor hat, dated 1971, circa size 54-55 (US 6 ¾ to 6 7/8). $270.00 Service visor hat for a Military Justice, Engineering, or Medical General Officer, 1972. Size 59. $175.00 Air Force general field visor hat, dated 1977. All-olive drab version with blue piping, part of the field uniform of Soviet generals and marshals that was used from 1972 and largely discontinued in 1980. Size 57. In excellent condition. $330.00 Air Force general papakha winter fur cap, circa 1960s. An extremely well made piece in very good to excellent condition. $250.00 Navy admiral service visor hat, dated 1971. An early example in very good to excellent condition. Size 58 (US size 7 1/4). $350.00 Marshal or General M40 hat badge, 1940-1955. Correct for either a visor hat or fur hat of the highest ranking Soviet officers. This very scarce WW2 version of the Soviet general's cockade is in excellent condition. $12.00 M 1964 Army or Air Force General hat badge, mid 1960s through 1991. Special type used exclusively by generals and marshals, this cockade is noticeably different from that for regular officers.